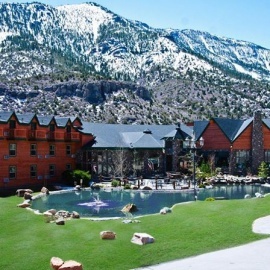 Only 30 minutes from the Las Vegas Strip, but a world away in atmosphere, the Resort on Mount Charleston is a rustic and relaxing pet friendly hotel retreat high in the mountains of the Humboldt-Toiyabe National Forest. Here in our majestic mountain surroundings, the air is crisp, the average temperature is 20 degrees cooler than Las Vegas all year round, and we’re surrounded by breathtaking views and outdoor activities for every season. Built in the early 1980s, the charming Resort on Mount Charleston underwent a multi-million dollar renovation and upgrade in 2005. The newly styled guest room and suite accommodations feature views of the surrounding Spring Mountains. Our guests enjoy excellent meals at A Cut Above, our full-service restaurant, as well as gourmet coffee, pastries, and light breakfast and lunch at The Bistro. 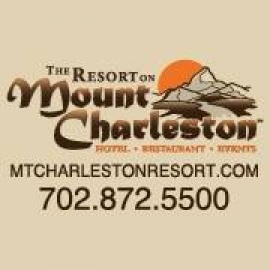 Whether you like your outdoors scenic or active, The Resort on Mount Charleston has plenty to offer. We’re located in the Spring Mountains National Recreation Area, near numerous hiking and mountain bike trails, camping areas, and picnic spots. If skiing, snowboarding or other snow sports are your preferred activity, the Las Vegas Ski and Snowboard Resort is just a 15-minute drive from our pet friendly Las Vegas resort.